It's 67 percent more powerful than last year's machine and starts at $899. While the Surface line has been a leader in the convertible device market, competition is coming from all angles, including Lenovo's Yoga line, Apple's iPad Pro and even the leather HP Spectre Folio that was just unveiled. 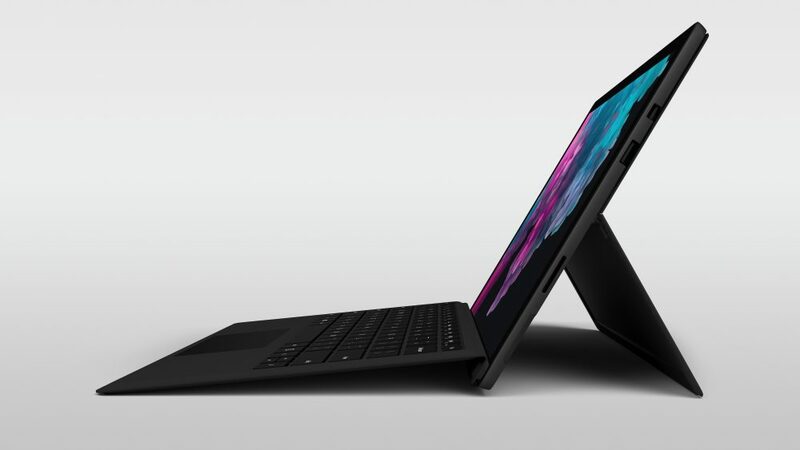 Last year's Surface Pro brought refinement to Microsoft's top-of-the-line convertible device, while staying incredibly light with great battery life. Now it's time for a refresh and the Surface Pro 6 comes with updated 8th generation Intel Core CPUs combined with up to 16GB of RAM and a 1 TB SSD all wrapped in black, blue, red or "platinum" grey. As shown by the leak earlier, it's sticking with same charging connector and USB 3.0 ports (no USB-C here). The design hasn't changed much, keeping that ubiquitous hinge and Surface Pen close by, and it's sticking to a 3:2 aspect ratio that helps maintain usefulness as a tablet. The 2,736 x 1,824 12.3-inch display is improved, at 267ppi and -- according to Panos Panay -- the best contrast ratio they've ever achieved. There's also an 8.0MP HD rear-facing camera to go with its 5MP / 1080p front-facing camera used for Windows Hello and video calls. The selling point of the Surface Pro is that it will help you get your work done anywhere, and these new models are looking to expand that range with 13.5 hours of battery life while maintaining the same 1.7 pound weight. It will go on sale alongside the Surface Laptop 2 beginning October 16th (pre-orders start today in the US, Canada, Australia, Austria, China, Germany, Ireland, Japan, New Zealand and UK), with the price for a Core i5 equipped model starting at $899, the lowest price we've seen for a Pro model at launch. The Microsoft Store just updated to offer the new models. It's currently available in two colors, black and grey. The highest-end version in black available is a Core i7 CPU with 16GB of RAM and 512GB storage for $1,899, but in grey you can opt for the entry level $899 model (i5/8GB/128GB) or a maxed-out i7/16GB/1TB edition for $2,299. Follow all the latest news from Microsoft's Surface event here!